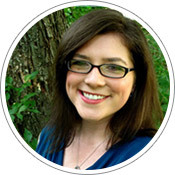 I’ve talked before about how much children value rituals, and how much I have enjoyed creating special moments with Darah that help set the rhythm of our days. Today I am bringing you another product that helps create a time of thoughtful reflection just before bedtime. It is called Good Night Pad and it is from Knock Knock. I’d love to tell you all about it! I love that it has a looped string on it, so that you can hang it up on the wall. This is a great way to ensure that it doesn’t get lost (very important in a busy toddler’s room!). I also find that it adds an element of reverence to the notepad. It is in a special place, where you have to make a point to go get it and to put it back. 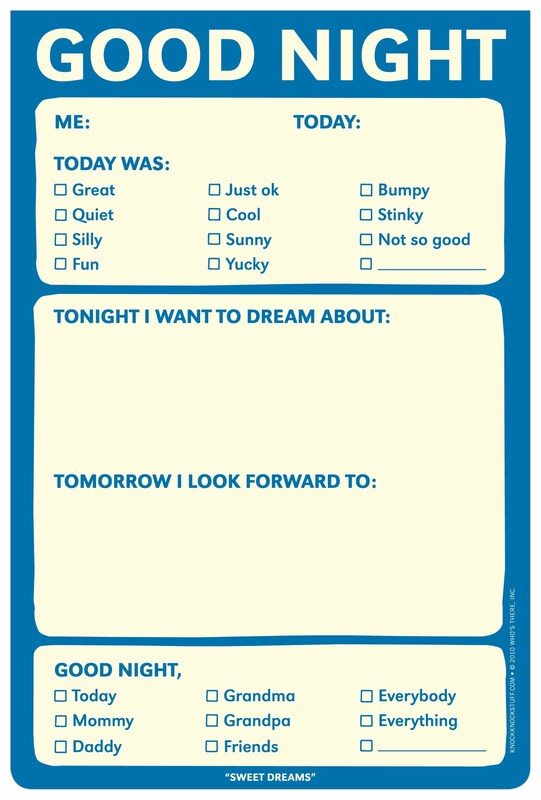 While we are really enjoying talking about our day even at this young age, I think this notepad is especially good for school age children, perhaps those with some basic writing skills. They can work on filling out their own pad while mom or dad sit with them. 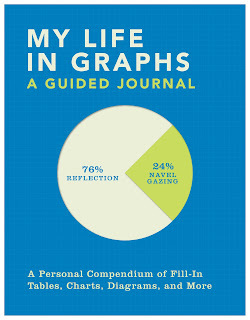 It really is like a first attempt at journaling, and teaches children the importance of reflection. I think this is a great way to add some quality time with your child into your day, and to inspire some great conversations and a time to reflect. The notepad is modestly priced at $8.00 for 40 sheets. It also comes with 60 stickers so that your child can decorate their pages! Knock Knock has a very impressive selection of products for just about about occasion or recipient. 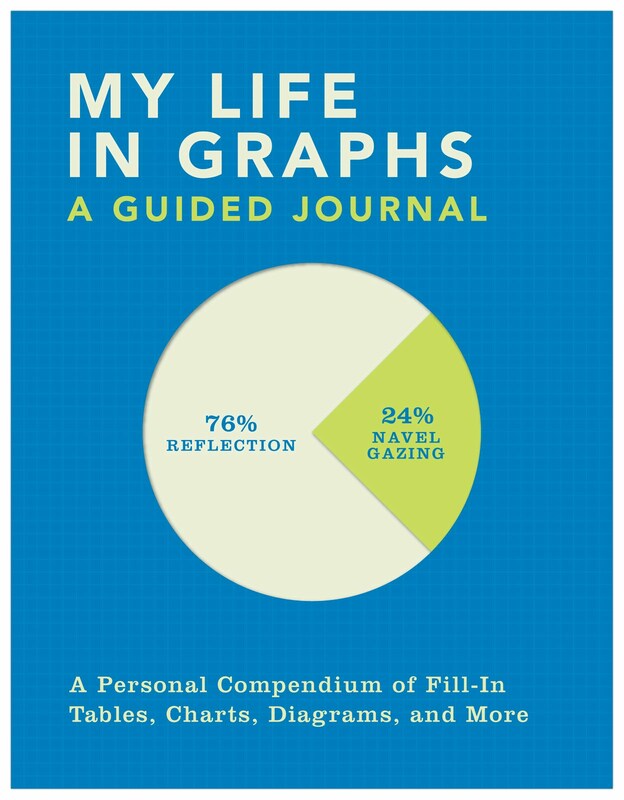 Some of my favorites include the Pep Talk Nifty Note and the My Life in Graphs Journal (I think this would really appeal to Tim!). Win it! 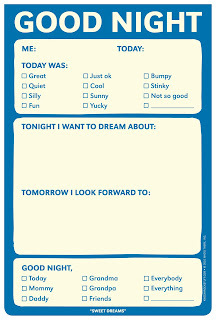 : One lucky Stuff Parents Need reader is going to snag the Good Night notepad from Knock Knock! Hooray! The contest will run until April 15th at 11:49pm EST when a winner will be selected via Random.org. The winner will have 48 hours to respond before the prize is forfeited and a new winner is selected. Open to residents of the United States. Limit one entrant per household, please. Mandatory entry: Tell me one other product offered by Knock Knock that you’d love to have! My answer: One additional product that I really like is the Vouchers for Friends. What a wonderful gift idea! Disclosure: This post was written for Family Review Network & Knock Knock who provided the complimentary product for review & giveaway in exchange for my honest opinions.